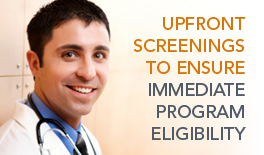 Hospital Eligibility Services, Patient and Facility Eligibility Service | Hospital Solutions, Inc.
HSI provides hospital eligibility services via Eligibility Specialist(s) who conduct on-site screening of self-pay patients to determine the potential reimbursement from a Federal/Local program. We conduct these services as a community outreach program, assisting patients through the eligibility process. Our main payors consist of Medicaid, Supplemental Security Income (SSI), County Indigent and Victims of Crime. Additionally, we provide lien services for those patient accounts whereby there is a third party liable for their injuries. Our comprehensive hospital eligibility services include morning and afternoon review of daily inpatient/outpatient/ER self-pay census for potential interviews. We also visit patients/family at bedside to determine eligibility. We establish DHHS interviews for eligible patients and provide transportation as necessary. As you can see we are very patient focused and try to engender trust and respect from everyone we associate with. Become part of our clients' "team"